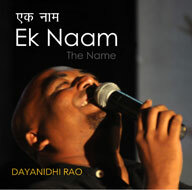 Dayanidhi Rao, by now a popular voice in Hindi Christian music and the Galilean award winning artist presents his new album Ek Naam (The Name). This 10 tracks album of worship songs includes ‘Gauanga Mein Tere Liye’, ‘Rehmat Khuda’, ‘Prabhu Bhalal Hai’, ‘Ei Pathik’, ‘Ek Naam’, ‘El Shaddai’, ‘Papini Yesu Prabhu’. Dayanidhi dedicates this album to his dear grand parents whose life values greatly inspires him.